We treveled as a family with nine adults and 2 children ages 2 and 5. The villa was very comfortable, kitchen fully equipped, the pool was amazing- the girls were at the pool the whole time. everything was clean and the pool was cleaned every day. Everything was great, a true paradise, no people around, beach was always for ourself, the only things i could reccomend: get swimming shoes for easier entrance to the sea and rent a car to be more mobile and being able to explore the whole island. Thank you to all stuff, we deffenatly will come back again! Accommodation comfortable with good bathroom and kitchen facilities, good air conditioning. Lovely pool, cleaned daily and plenty of comfortable poolside furniture. Being able to order food from the villa on the app was great. Great location! 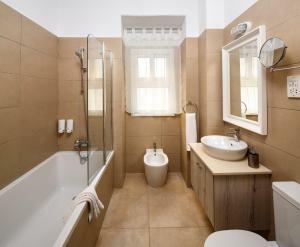 Great villas which is includes pool cleaning almost every day and also housekeeping 2-3 times per week. Which for us as a family was perfect, best of two worlds. Friendly staff and a nice little bar on the private beach where you also can buy some groceries and other things. Highly recommended! THE OWNER-FAMILY GIVE A VERY PERSONAL SERVICE. THEIR ATTENTION TO GUESTS IS A FIVE STARS ATTENTION. THE VILLAS AND THE SWIMMING POOLS ARE VERY CLEAN. THE SMALL BUT LOVELY BARR INVITES SERVES YOU WITH FOOD AND DRINKS AND THE KIOSK IS WELL EQUIPPED. The cleanliness and comfort of the villa was excellent. The area had a fantastic family feel with a very relaxing environment created The service throughout was excellent. 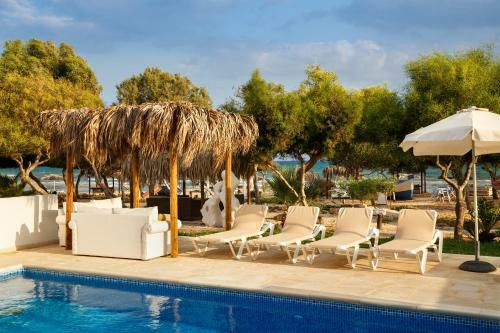 The owner and his son are very friendly and welcoming as well the staff, huge private pool, very good sized rooms, nice beach I loved the decorations near the beach area, very safe place, Ayia Napa very close 15 min by car, amazing resturants and coffee shops there, good facilities. 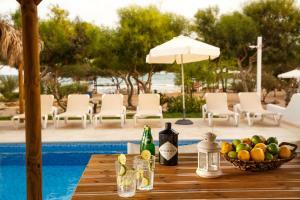 Lock in a great price for Thalassines Beach Villas – rated 9.5 by recent guests! One of our top picks in Ayia Napa.This family-run property offers self-contained villas a few feet away from a secluded beach in Ayia Napa. Featuring free WiFi, each villa has its own private pool and roof terrace with views of the Mediterranean. The snack bar by the beach serves breakfast, snacks and cocktails. Inside, Thalassines Beach Villas offers bright, spacious seating areas and satellite TV. Cutlery, a refrigerator and a tea/coffee maker can be found in the kitchens. Thalassines Beach Villas feature natural, lush gardens and shaded dining areas by the pool where guests can enjoy freshly cooked meals with locally sourced products. All sunbeds and umbrellas are provided free of charge on the beach exclusively to the villas' residents. An open-air cinema by the beach is also available to guests, as well as a beachfront cabana where guests can enjoy body and facial treatments. A car rental service is provided by Thalassines Villas. National Forest Park Kavo Gkreko is a 10-minute drive away. This property is also rated for the best value in Ayia Napa! Guests are getting more for their money when compared to other properties in this city. 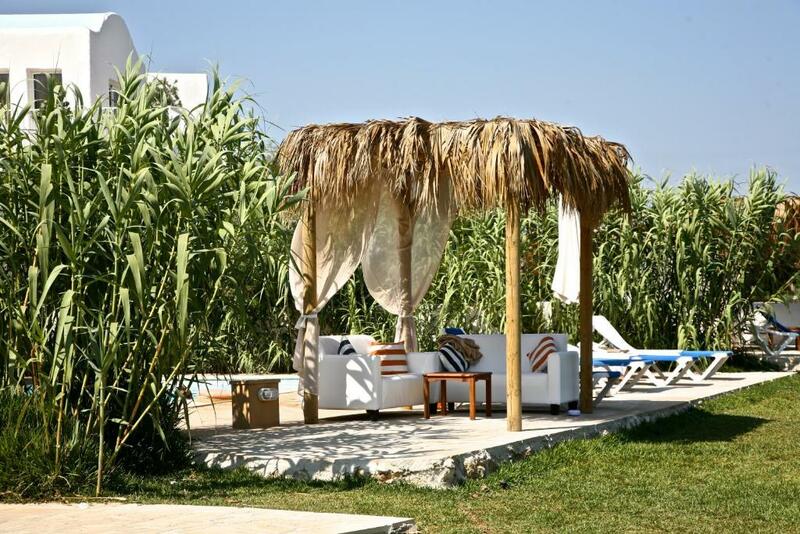 When would you like to stay at Thalassines Beach Villas? -private access to the beach, located within short distance. Rooms are 158 square yards. Family run business, villas are located on the beach, sunbeds/umbrellas/sofas/towels on the beach are for the exclusive use of the residents of the villas, as well as the beach bar, cafeteria, beach cinema & Cabana Spa. Located in a quiet area, close to the picturesque fishing harbour of Liopetri River and just 10 minutes drive from the busy centre of Ayia Napa. House Rules Thalassines Beach Villas takes special requests – add in the next step! Thalassines Beach Villas accepts these cards and reserves the right to temporarily hold an amount prior to arrival. Please note that private parties and loud music are not allowed. Please note that groups under 28 years old cannot be accommodated in this property. In such cases cancellation policies will apply as normal. Please note that all the facilities are for exclusive use of the property's guests. Please inform Thalassines Beach Villas of your expected arrival time in advance. You can use the Special Requests box when booking, or contact the property directly using the contact details in your confirmation. The private beach is nice but it's a bit difficult to enter the sea and swim if you don't wear shoes, since its very "rocky". The kitchen equipment is a bit poor for a family, maybe a few more pots and pans would help. It's nessesary to rent a car go shopping for groceries etc.